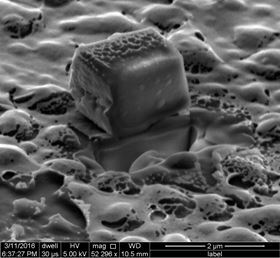 An isolated cement cube created in the lab of Rice materials scientist Rouzbeh Shahsavari. Microscopic cubes and other shapes may serve as 'seeds' in programmable cement, allowing the production of stronger, less porous and more environmentally-friendly concrete. Image: Multiscale Materials Laboratory/Rice University. Bringing order to disorder is key to making stronger and greener cement, the paste that binds concrete. Scientists at Rice University have decoded the kinetic properties of cement and developed a way to ‘program’ the microscopic, semi-crystalline particles within. Their process, described in a paper in the Journal of Materials Chemistry A, turns particles from disordered clumps into regimented cubes, spheres and other forms that combine to make the material less porous and more durable. This technique may lead to stronger structures that require less concrete – and less is better, said Rice materials scientist and lead author Rouzbeh Shahsavari. Worldwide production of more than 3 billion tons of concrete a year now accounts for as much as 10% of the carbon dioxide, a greenhouse gas, released into the atmosphere. Through extensive experiments, Shahsavari and his colleagues decoded the nanoscale reactions – or ‘morphogenesis’ – of the crystallization within calcium-silicate hydrate (C-S-H) cement that holds concrete together. For the first time, they synthesized C-S-H particles in a variety of shapes, including cubes, rectangular prisms, dendrites, core-shells and rhombohedra, and mapped them into a unified morphology diagram for manufacturers and builders who wish to engineer concrete from the bottom up. "We call it programmable cement," he said. "The great advance of this work is that it's the first step in controlling the kinetics of cement to get desired shapes. We show how one can control the morphology and size of the basic building blocks of C-S-H so that they can self-assemble into microstructures with far greater packing density compared with conventional amorphous C-S-H microstructures." He said the idea is akin to the self-assembly of metallic crystals and polymers. "It's a hot area, and researchers are taking advantage of it," Shahsavari said. "But when it comes to cement and concrete, it is extremely difficult to control their bottom-up assembly. Our work provides the first recipe for such advanced synthesis. "The seed particles form first, automatically, in our reactions, and then they dominate the process as the rest of the material forms around them. That's the beauty of it. It's in situ, seed-mediated growth and does not require external addition of seed particles, as commonly done in the industry to promote crystallization and growth." Previous techniques to create ordered crystals in C-S-H required high temperatures or pressures, prolonged reaction times and the use of organic precursors, but none are efficient or environmentally benign, Shahsavari said. The Rice scientists were able to create well-shaped cubes and rectangles by adding small amounts of positive or negative ionic surfactants and calcium silicate to C-S-H and exposing the mix to carbon dioxide and ultrasonic sound. The crystal seeds took shape around the surfactant micelles within 25 minutes. Decreasing the calcium silicate yielded more spherical particles and smaller cubes, while increasing it led to the formation of clumped spheres and interlocking cubes. Once the calcite ‘seeds’ form, they trigger the molecules around them to self-assemble into cubes, spheres and other shapes that are orders of magnitude larger. These can pack more tightly together in concrete than amorphous particles, Shahsavari explained. Carefully modulating the precursor concentration, temperature and duration of the reaction varies the yield, size and morphology of the final particles. According to Shahsavari, this discovery is an important step in concrete research. It builds upon his work as part of the Massachusetts Institute of Technology team that decoded cement's molecular ‘DNA’ in 2009. "There is currently no control over C-S-H shape," he said. "The concrete used today is an amorphous colloid with significant porosity that entails reduced strength and durability." Concrete is one focus of Shahsavari's lab, which has studied both its macroscale manufacture and intrinsic nanoscale properties. Because concrete is the world's most common construction material and a significant source of atmospheric carbon dioxide, he is convinced of the importance of developing ‘greener’ concrete. The new technique has several environmental benefits, Shahsavari said. "One is that you need less of it (the concrete) because it is stronger. This stems from better packing of the cubic particles, which leads to stronger microstructures. The other is that it will be more durable. Less porosity makes it harder for unwanted chemicals to find a path through the concrete, so it does a better job of protecting steel reinforcement inside." To conduct this research, the team first had to develop a method for testing the strength of microscopic concrete particles. The method they came up with uses a diamond-tipped nanoindenter to crush single cement particles with a flat edge. They programmed the indenter to move from one nanoparticle to the next, crushing them in turn, and gathered mechanical data on hundreds of particles of various shapes in one run. "Other research groups have tested bulk cement and concrete, but no group had ever probed the mechanics of single C-S-H particles and the effect of shape on mechanics of individual particles," Shahsavari said. He added that strategies developed during the project could have implications for other applications, including bone tissue engineering, drug delivery and refractory materials, and could impact such other complex systems as ceramics and colloids. Inspired by arthropod shells, researchers have 3D-printed structural elements from cement paste that get tougher under pressure.